Cairns diving trips and scuba diving day tours depart daily, taking certified divers of all experience levels to enjoy and explore the Great Barrier Reef. If you would like to try diving and are not a certified diver then please see our page on Cairns Introductory Dives. The Great Barrier Reef is comprised of more than 2,900 individual reefs. Cairns is the best place for Great Barrier Reef dive trips, with several reefs very close to shore and accessible for day tours, these include: Milln, Moore, Hastings, Saxon, Thetford, Briggs, Upolu, Paradise and Michaelmas Reefs, to name just a few. Cairns has excellent Great Barrier Reef diving conditions year round, including warm, clear water, abundant corals and marine life. Water temperatures vary from 29 degrees in Summer to 23 degrees in Winter and lycra or wet suits are available on all boats. Cairns is the closest mainland point to the Great Barrier Reef, which means less travel time and more dive time! Some operators visit up to three different reef sites during the day, giving you up to six (6) hours on the reef. Travel time is usually no longer than two (2) hours each way, generally less, depending on who you choose. There are over 16 scuba diving day tours departing Cairns daily. They range in price, destination, boat and inclusions and cater to certified divers of all experience levels, from the novice to the advanced. It is best to review what is on offer before making your final tour decision. Day tour packages can be tailored to suit your preference and may include one, two or three certified dives, with or without equipment hire. Some Cairns dive day tours visit the Outer Great Barrier Reef, others travel to coral and sand cays and tropical islands, while others visit reef pontoons. The diving at all locations is excellent, but conditions may vary: to assist with your decision making, please see the below notes. Cairns’ Outer Great Barrier Reef dive sites offer pristine coral reefs with depths ranging from 2 – 35m. Individual features vary: some have coral caves, walls and drop offs, others have towers, bommies and swim throughs. 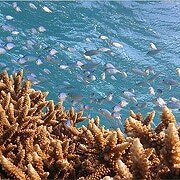 All are home to an amazing diversity of Great Barrier Reef marine and coral life. Most of these tours offer a choice of guided or unguided diving and if you don’t have your own buddy, they’ll pair you up with someone on the boat. Travel time to Cairns’ Outer Great Barrier Reef sites is usually anywhere between 90-minutes to 2 hours. Cairns Outer Reef Day Diving. Outer Reef Pontoon dive packages are generally Cairns’ most expensive scuba diving day tours. Why? As well as scuba diving, you get to enjoy and utilize all of the other facilities and activities at the pontoon, including, but not limited to: freshwater showers and change rooms, shaded seating and sundecks, underwater observatories, semi-submersible and glass bottom boat tours and touch tanks. Scuba diving on these trips is either done straight from the pontoon itself, or with a tender transfer to nearby dive sites. Maximum depth is generally 18m: all pontoon dives are guided. Cairns scuba dive tours to sand cays and tropical islands, like Michaelmas and Upolu Cay, Green Island and Fitzroy Island, offer shallow, protected waters with vibrant, fringing coral reefs and giant clam gardens. These trips are ideal for inexperienced divers or those travelling with non-divers. Due to their somewhat sheltered locations, the currents here are generally not as strong as they can be on open water sites and there is an abundance of marine life, including large schools of parrotfish and bat fish, turtles, soft corals and more. Maximum depths are generally >15m: all dives are guided. Departure times for Cairns dive day tours vary from operator to operator, the first boats leave at 7.30am and the final departure is at 10.30am. There are no half day tours. Standard price inclusions are the boat trip to the reef, tea and coffee, lunch and a marine biologist presentation. Some packages include additional activities and optional extras, such as scenic helicopter flights. Cairns Diving Trips: All dive equipment is provided onboard and Divemasters / Instructors provide comprehensive dive briefings en route to the Great Barrier Reef, covering the equipment, dive signals and dive site overviews.